Batman sure knows how to pick 'em. I'll admit something to you right off the bat: I wanted to like this movie more than I actually did. Don't get me wrong; it's a very good movie and I'm glad to have seen it, but I think I had built up my expectations to a level that could never be met, regardless of how good the movie is. See, for years, 1940's The Mark of Zorro has been known to me as the movie that a young Bruce Wayne and his parents had just seen when they were gunned down in an area of Gotham City known as Crime Alley. Legend has it, according to at least two comic book writers, that Thomas, Martha, and Bruce Wayne had just left the theater and were walking home when they were approached by Joe Chill, and the events that followed changed the course of Bruce's life forever. I've always liked this particular origin because it meant that Batman was motivated not just by the death of his parents, but by the heroism of Zorro that he had witnessed on screen that night and that Zorro's habit of dressing up in a costume with a mask and fighting for justice stayed with Bruce until he was old enough to do the same. This is what makes Christopher Nolan's decision to change the movie (we all love movies) into an opera (we don't all love opera) in <i>Batman Begins</i> ill-advised to me. It further distances the character from the rest of us. Maybe that was the point, but I like an approachable Batman. Now, thanks to a beautifully-restored Blu-ray from Kino Lorber, I own the movie that at least partially made Batman. And it's a good movie! 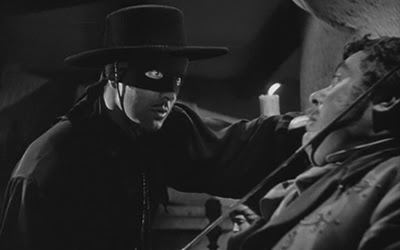 Tyrone Power is Diego by day and the masked harbinger of justice by night, Zorro. He's a real charmer as Diego, and a real tough guy as Zorro, giving Power some vast waters to navigate and show some range. Zorro swoops in through windows and secret passages, swishing the letter "Z" onto anything and everything nearby. Hmmm, it's just occurred to me that Zorro's "Z" isn't all that different from the bat symbol used by Batman. Anyway, there's swashbuckling aplenty to be had in this movie from 20th Century Fox. The studio was clearly (at least in my opinion) chasing the success Warner Brothers had found a couple of years earlier with their rousing adaptation of The Adventures of Robin Hood, starring Errol Flynn. To me, WB's film holds up better now than Fox's Zorro, not just because the Flynn picture felt fresh and moves at a brisk pace, but because The Mark of Zorro, for all its swashbuckling adventure and excitement, is plagued by long periods of romantic conversation with Linda Darnell (John Ford's My Darling Clementine) that I just can't invest in at all. The Mark of Zorro also takes its sweet time getting started with Diego not becoming the masked hero until what feels like a third of the way into the movie. The real star of The Mark of Zorro is Basil Rathbone. I've become quite a fan of Rathbone in the last few years; his work as the titular Son of Frankenstein is outstanding, and his time in the role of Sherlock Holmes during the late 1930's and 1940's will probably go down in history as the definitive take on the detective. How can you argue, when he appeared as the character in 14 feature films and cemented the image we have of the pipe-smoking, deerstalker-hat-wearing genius? 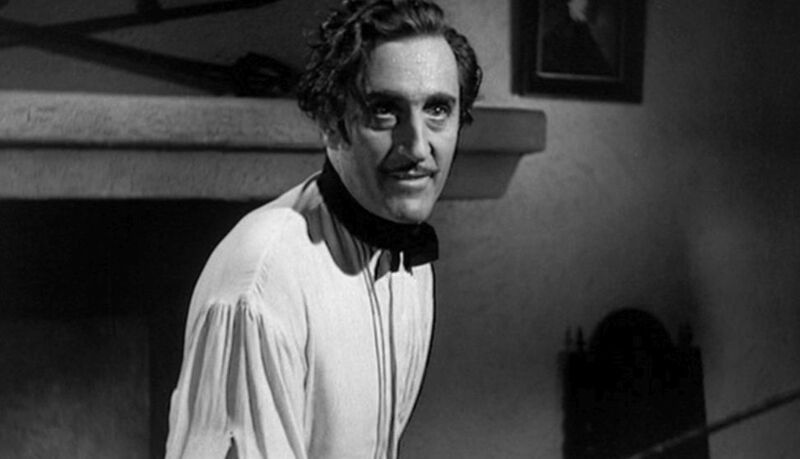 Rathbone was in 1938's The Adventures of Robin Hood as Guy of Gisbourne, and since The Mark of Zorro seems to have no qualms about chasing the success of that film, this movie pits him against Zorro as another heavy. Here he plays Captain Esteban Pasquale, a slimy official with motivations of his own. 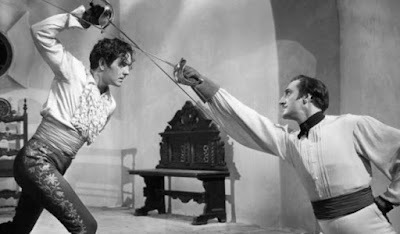 The cool thing about Basil Rathbone is that he was an accomplished swordsman in his own right, and is regarded by many people who decide such things to have been the best fencing actor working in Hollywood. His duel with Errol Flynn in The Adventures of Robin Hood is legendary, but his duel with Tyrone Power in The Mark of Zorro is unbelievable. Seriously, I don't think I've ever seen a better movie sword fight. There's not much of the usual climbing up stairs, jumping onto tables, and swinging from chandeliers that you see in a lot of duels from this era of movies; instead, what you'll find is a flurry of swords by two actors who were really making it count. They really look like they're trying to kill each other, and what makes it even better is that you can see their faces throughout most of the duel, connecting the sword abilities to the actors themselves. It's pretty incredible. I'm also awarding The Mark of Zorro the inaugural Golden Spoon Award for the following line of dialogue spoken as a warning to Zorro: "You handle that sword like a devil from hell, and that's exactly where you're going." Burn! Even better, that burn comes from 1940! The film is directed by Rouben Mamoulian, who had made what I believe is the first non-silent adaptation of Dr. Jekyll and Mr. Hyde for Paramount in 1931. That movie starred Frederick March, who won an Academy Award for the dual role as Jekyll and Hyde, and was filled with sexuality, causing controversy in later years when the Hays Code really started to become the decency police. Mamoulian clearly knows how to make good movies, and The Mark of Zorro is no exception. This film won an Oscar for best score, contributed by Alfred Newman. The restored print found on Kino's Blu-ray looks outstanding, and if the movie weren't made in black and white and the line delivery didn't have that machine-gun-staccato distinct to films of the 1930's and 1940's, you would swear that it could have been filmed yesterday. There's also occasional and surprising violence that you don't usually expect in movies from this time period. When a bad guy gets run through with Zorro's sword, it's alarming to see a blood stain slowly spread from the wound. It's little touches like this, as well as the swashbuckling sense of adventure, that will have me returning to The Mark of Zorro in the future. It wasn't exactly what I was expecting, but that's not this movie's fault; it's mine. I know now what to expect in the future. After all, if it's good enough for Batman, it's good enough for me. You can buy The Mark of Zorro here. 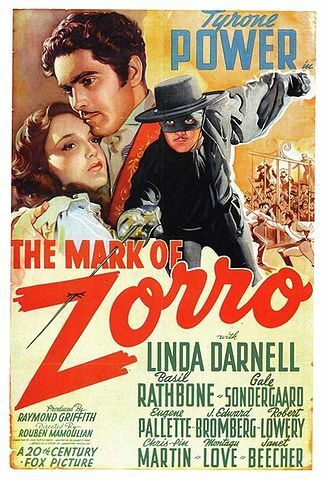 I dislike the implication that 1940's "The Mark of Zorro" was the movie Batman saw that night, and I prefer the version in which Bruce saw the original 1920 movie of the same name. It makes more sense, since that was the movie that inspired Kane and Finger in the creation of the character. Your comment raises a fair point. Technically, both versions (the Tyrone Power and the silent Fairbanks film) are considered acceptable Batman "cannon." You're right, Bill Finger and Kane were totally inspired by the silent film. But the comics that I read when I was younger, including Frank Miller's "The Dark Knight Returns," update the movie version that the Thomas, Martha, and Bruce saw that fateful night to the Tyrone Power film, probably because of the forties/noir connections. I think it just depends on the writer.